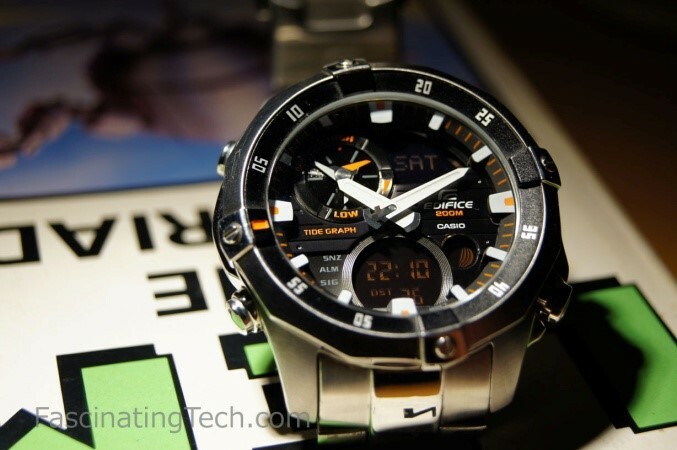 The Casio Edifice is a well made and suitably functional wristwatch. It serves its prime purpose of telling the time very well with little evidence of loosing seconds so far. Its recessed glass facia helps reduce the opportunity for scratching and the wristband still looks good after 4 months of continuous wear. Its build quality is excellent and it's weight is just right, letting you know it's there without becoming obtrusive. Overall, a watch I should have bought earlier. The watch is on my wrist almost constantly and does not look out of place whether I am in a suit meeting clients, in old jeans doing DIY, or in casual clothes doing photography or going shopping. I like the looks; the black facia with white markings and orange accents are nicely framed by the silvered body and strap. The hour marks are not numbered but flashed with white while the 3, 6, 9 and 12 marks are accented in orange. The white analogue hands are easy to see without hiding too much of the background and have silvered back ends. There is no second hand and no accompanying "tic" sound. The glass facia is slightly convex and quite scratch resistant and sits lower than the divers bezel helping the glass stay scratch free. The face of the watch has three digital displays at the 1, 4 and 6 hour locations and a small analogue display between the 10 and 11 hour mark. The digital displays are a little dim but this actually helps as it does not distract from the analogue hands. The analogue section holds the tide height indicator but again is not obtrusive and does not interfere with the time hands or reading the time. 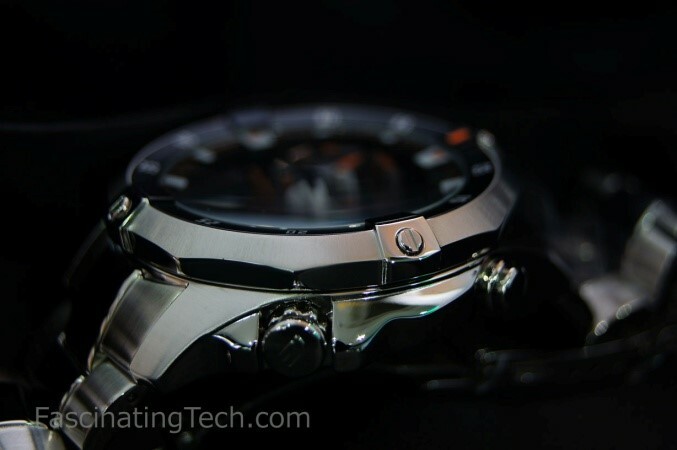 The bezel is of the rotating divers type and sits marginally higher that the highest point of the glass facia. Like similar bezels it rotates anti-clockwise only with a pleasing tight action which is unlikely to be moved accidentally. The inside bezel is black with white lettering while the outside is brushed steel. There are simulated screws at the 3, 6, 9 and 12 hour marks with intermediate areas marked by minutes (05, 10, screw, 20, 25, screw, 35,40, screw, 50,55, screw). The 12 0'clock position is again flashed in orange. There are four function buttons fitted to the lower body below the bezel which ride low on the watch, close to the wrist. Each are made of polished steel with the bottom right button slightly larger than the others, embellished with the edifice logo, and looking like a locked down crown. The strap itself is stainless steel with 15+ three-piece rectangular segments with the edges brushed and the central segment polished - a nice look without being overbearing. The clasp is of the standard safety design with a locking loop and push buttons on either side to release the strap. 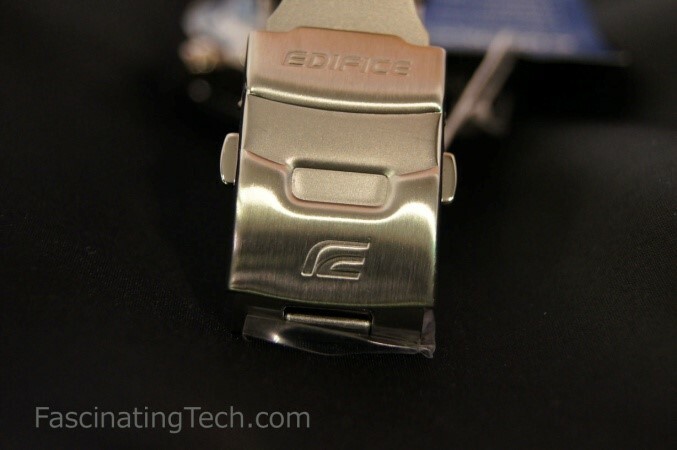 The edifice name and logo are stamped into the clasp. 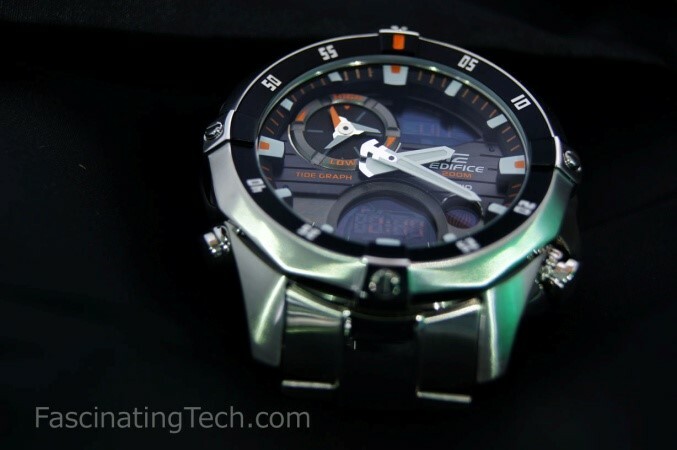 The watch comes in two flavours - One with orange accents as reviewed here, or with deep blue accents. My preference was for the orange but the blue also looked good. 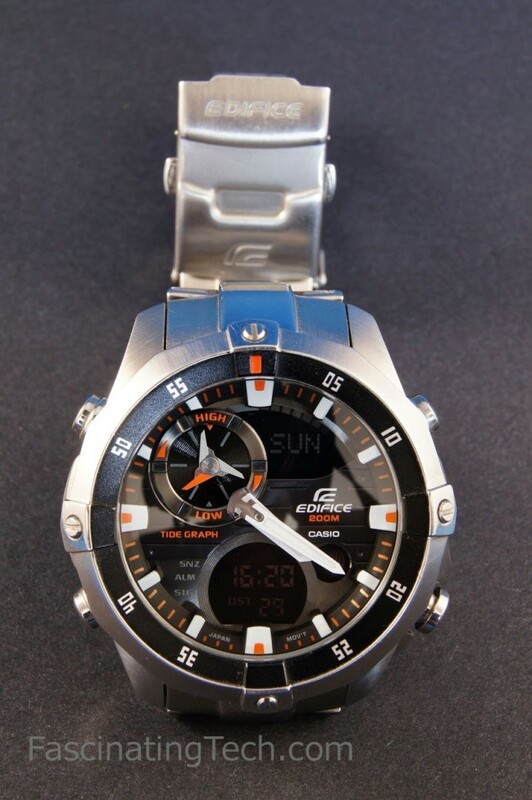 When looking for a new watch, my primary needs were for a digi-analogue watch which clearly presented the time and date, had a nice weight and feel, needed little maintenance \ had a good battery life, and was within my budget. 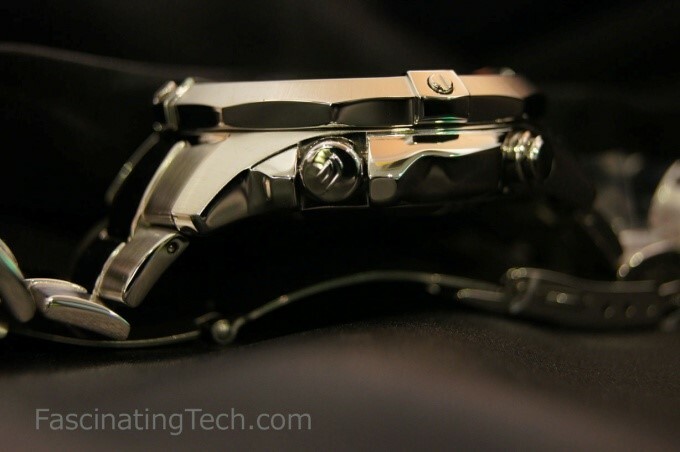 This watch covered all my requirements with the extra functions providing a nice bonus. The analogue hands are easy to read even with the information displayed in the background. The hour and minute hands are easy to distinguish and the hour marks on the facia are easy to identify. The lower digital readout (between the 5 and 7 hour marks) can show the time in 12 or 24 hour format (your preference) or can show the date. This is toggled by a push on the top left button. The watch has a fully automatic calendar synched up to the year 2099 accommodating leap years and the varying month lengths. When displaying the date or time in the bottom digital window, the window at the 1 o'clock position shows the day name. Time setting is accomplished by setting the digital element to the correct time; the analogue hands then move to reflect this. There have been instances where the analogue hands drift out of sync (usually if I leave my watch by a speaker or other magnetic source) but it's quite straight forward to adjust the hands via one of the functions described in the manual (moving the hands to the 12 o'clock position and on ok, the hands moving the correct position to reflect the digital time). Based on the displayed date and time, the digital window at the 5 o'clock position shows the approximate moon phase via a graphical representation (a circle with a number of filled or blank arcs). The user is able to configure the display to choose whether the filled arcs represent the moons visible element or its shadow. Again, tied to the date \ time, the analogue display at the 10 o'clock position represents the tide height via a High \ Low tide register and a dial pointing to the approximate current tide height. Both of the displays above can be adjusted to show the phase and tide height for any calendar date and time accessible on the watch - IE, you can scroll to a date in the past \ future and display the moon phase and tide height for that date \ time. 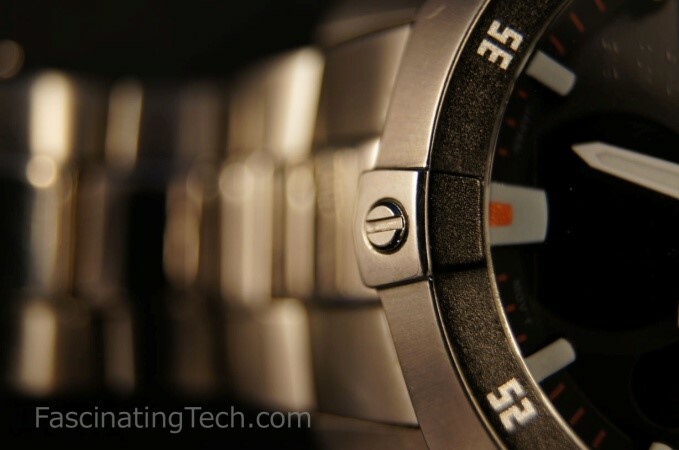 The watch can take temperature readings of the surroundings with documented accuracy of 0.1˚C. The display appears in the bottom digital window with updates after 3 seconds, then every 2 seconds for the first 2 minutes, then every 2 minutes thereafter. Its recommended that the watch is left alone, off the wrist for a few minutes before the temperature is read. The light can be configured to power on for 1.5 or 3 seconds and produces a light blue wash across the dials \ facia. Depending on the angle some of the digital elements are a little hard to read but the analogue hands show up nicely. Where guidance or notes on use are provided, these are the reviewers observations at the time of review and may not necessarily represent the best, easiest, recommended or proper use of it. A very big thank you to "The Watch Shop" in Cross Street, Reading for allowing me to take photographs of a pristine version of the watch for this review. 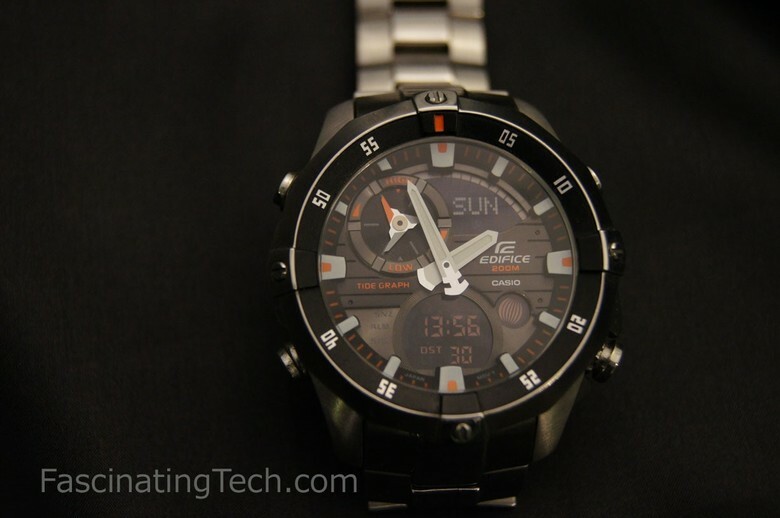 This review was performed against my own Edifice watch purchased in April 2014. All photographs accompanying the article were taken by me but the subject may be my own watch or the pristine version from The Watch Shop.